Some projects generate a lot more waste material than others do and that’s when it’s time to consider a slightly larger dumpster size. A 10 yard dumpster can pack a lot of material in a compact space. It’s big enough to use on small commercial jobs, but it’s best for those larger home renovation projects. If there are a couple of projects you’ve been putting off why not save a bit of money and tackle them both at once? This dumpster is a good fit in this scenario. What Does A Ten Yard Roll Off Dumpster Cost? Certainly, prices will vary throughout the country, but you should be budgeting between $300-$400 for your dumpster rental. On average, the ten yard container will cost about $350, which includes a 1-1.5 tons of disposal, 7 days rental and of course, the Bin There Dump That driveway protection system. Consult with your local Dumpster Consultant on the price of a ten yard bin in your area. What Are The Dimensions Of This Container? It measures 10 cubic yards. The actual dumpster is 10 feet long, 4 feet high and 7 feet wide. If you need a visual reference, you can see one here. As you can see, this is a good in between size for small to medium projects. What Does A Ten Yard Bin Weigh Empty? Our dumpster weighs approximately 2,220 lbs but can carry over a ton worth of waste. The average homeowner may have a bit of trouble judging what size dumpster is the best fit for different projects. It might be useful to look at some cases where a 10 yard dumpster would be a good option. If you’re taking on a remodel of your main bathroom, or if you’re ready to modernize a small kitchen this is the dumpster you want in your driveway. It’s big enough to handle old cabinets, tiles, and even small appliances without much trouble. De-Cluttering a Garage or Basement? After living in a home for a few years, your basement and garage can start to take on a life of their own. We’ve all stored away an item or two that we know we have a use for – we just don’t know what that might be. It takes some courage to own up to the fact that you’ll probably never use those items after all, but when you’re ready to take that step a 10 yard dumpster is probably the perfect size for these kinds of projects. For the soon to be empty nesters, this dumpster makes a lot of sense as well. As much as you love your kids, there’s no doubt that they’ve likely accumulated a lot of junk over the years. Whether they’re just heading off to college, or they’re leaving the family home for good – it could be the ideal time to rid yourself of all that clutter. Perhaps you want to turn your son’s room into your new home office, or maybe you want to convert your daughter’s room into a family music room. Whatever the case may be, you’ll have a lot of material to dispose of so you’ll need more than a 4 or 6 yard dumpster. The 10 yard option will work well for these kinds of life transition home makeovers. Home improvement projects can take you outdoors as well. If you’ve decided it’s time for a new fence, you’ll need to get rid of the old one. The dumpster delivered right to your driveway is great for this kind of outdoor improvement project. Bin There Dump That’s 10 yard dumpster also happens to be the most popular choice for roofing as well. It’s the perfect size for this type of project. Anyone that’s had the opportunity to carry some roofing tiles up a ladder knows how heavy they can be. For these jobs you don’t want anything larger because of potential weight issues. 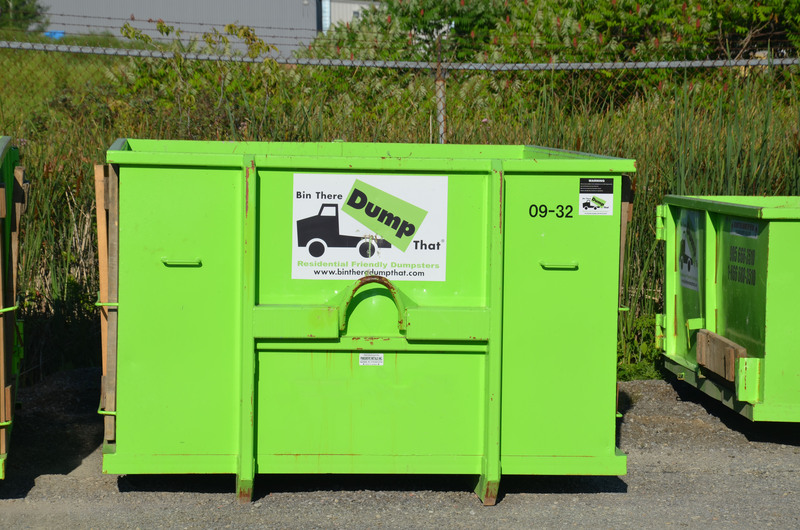 If we were to point to one thing that homeowners love about our residential friendly dumpsters it would have to be their compact size – other than the bold green color of course. They’re designed to fit easily in your driveway without getting in your way. They take up a lot less room than the 10 yard dumpsters available from our competitors. Our dumpster is 10x7x4 and our competitors are typically about 14 feet long. That’s a lot of extra space in your driveway and that can make it difficult to work around. 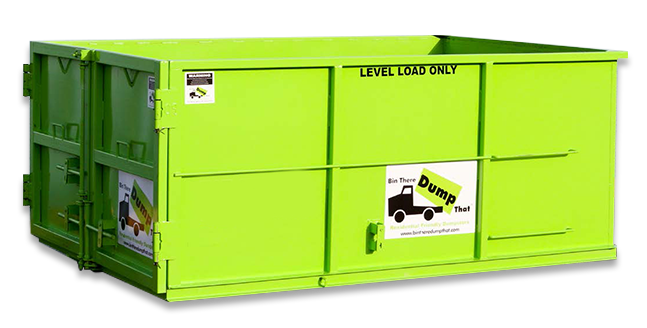 With the Bin There Dump That dumpster, you get the same disposal space without losing all of your driveway space. We make it up by making our dumpsters just a little bit taller than average. For anyone that’s still not quite convinced that renting a dumpster is the right way to go another comparison may help. Let’s say for example, that you’re considering hiring someone with a pickup truck. They would have to make three separate trips to the dump to take away all of the material that you can remove with one 10 yard dumpster. Depending on how far the landfill site is from your home, those trips could get very expensive with all of the extra fuel your helper will be burning. With a dumpster form Bin There Dump That, you pay one set price (as long as you don’t go over your weight limit) and you only have to fill it once. Once you’re done, you just call for pick up and it’s taken away for you. It’s quick and it’s easy. Best of all rentals are typically based on a five to seven day period so there’s no rush to get the job done. If a dumpster sounds like the right choice, but you’re not sure which size is right for your next project there’s no need to be too concerned. Our Dumpster Consultants have tons of experience helping homeowners just like you make the right choice for their needs. We can do the same for you. You can have the ideal dumpster delivered to your home without ever leaving your favorite chair. You will have to leave that comfortable spot to get started on that big project though! You're close to renting a dumpster and getting rid of your waste! Enter your ZIP code or City name and we will locate the closest Bin There Dump That franchise to you.